Rumour has it that it’s the best falafel in Zurich. It attracts all the hipsters in with its stress-free, in-your-face attitude. However to me, the highlight of this shadowy, plastic wall covered street food stand is not really the food, but the experience. There is something charming about the pound of their speakers playing Hip-Hop to accompany the parade of hungry youngsters lit by the stand’s neon lighting. 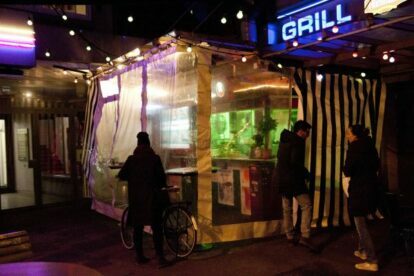 It is rare to find street food that can be healthy, and Palestine Grill is one of them. Crusty on the outside, juicy on the inside, their falafel is fresh and satisfying. Their homemade hummus is smooth, and perfect with some pita chips or if you want to flip into “planet delicious”, use it as a dip to the falafel. And, make sure to try their Palestinian beer (Taybeh). It is one of the few places in town where you can get it. There will be a line, it will be crowded, smoky and the occasional strange drunk might make an appearance, but it is worth it. It’s after all, the Langstrasse and not the Paradeplatz – even though silly drunks are aplenty in both. What’s also great about it, is the charisma of the people behind the grill, who for some reason, appear to have not a worry in the world. Or perhaps I have been lucky. Do your belly a favour and pay a visit to the Palestine Grill.